There should be a club for those that consider themselves as ‘Amouage Addicts’. We could all sit around discussing our adoration for the Omani house, pouring over our favourites and consoling each other over the fact that we’ll never be able to own them all. One matter that definitely would not be up for discussion however, is the idea of giving the house up any time soon. It’s simply not on the table. We are truly helpless really, what with the annual masculine and feminine pairings. Not to mention special editions such as Beloved and the highly artistic and fascinating Library Collection. The truth is that we are mere lemmings for Amouage and we wouldn’t have it any other way. This year’s addition to the Library Collection is Opus VII. Created by perfumers Pierre Negrin and Alberto Morillas it “arouses the juxtaposition of harmon with the intensity of reasoning between conflicting ideas and beliefs” . Much like the chaos of the Interlude duo from last year, Opus VII appears to take a slightly more abstract approach with its dark black flacon serving as a small hint for the wild ride that’s unleashed upon the very first spritz. Opus VII’s first impression is of emerald green leather. The use of bitter, almost-metallic galbanum is a shock at first but with each wear it becomes apparent that it is a small stroke of genius. This fatal attraction between the galbanum and the cracked aged leather speaks of a dark, wicked fetish and makes for one of the most compelling and attractive fragrant opening acts this year. The second act appears in a cloud of wood smoke, swirling intensely around the initial accord, shrouding the striking colours and ultimately softening them – what was at first bold and striking, soon becomes smooth but maintains the heated intensity that makes Opus VII so bold, complex and ultimately enjoyable. In the base there is more than a distinct whisper of the chocolatey amber so wonderfully used in last year’s Opus VI (as Persolaise points out) and this is no surprise as Pierre Negrin has worked on both fragrances. The distinct difference with VII however, is its ability to contrast the plush texture of the amber with whispers of greenery and damp earth, unreservedly throwing beauty and danger into the fire together. Opus VII is definitely one of the harshest Amouage fragrances to date, and perhaps one of the most difficult to contend with. This is by no means a point of criticism – it is most definitely a beauty rather than a beast – and I would also say that it is one of the brand’s more daring fragrances and I have spent many an hour sniffing it and trying to fathom out what makes it tick. The reward comes with the fact that, whilst daring, Opus VII is a fully functioning, high art fragrance that has the ability to fascinate and beguile whilst wearing comfortably enough on the skin. 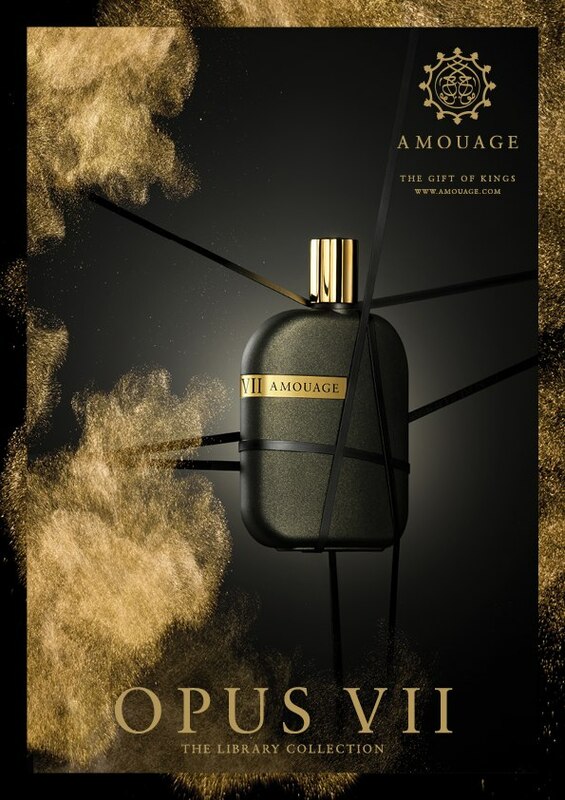 It’s a jewel in the Amouage crown that one would be a fool not to discover. Opus VII is available in 100ml Eau de Parfum for £215. Sample provided by Amouage. Notes via Basenotes. Image 1 via fragrantica.com. Image 2 via hautearabiaedit.com. nstperfume.com. Posted in Amouage, Green, Leather, Oriental, Perfume Reviews, Unisex and tagged Alberto Morillas, Amouage, Christoper Chong, Green, Leather, Library Collection, Opus VII, Oriental, Perfume, Pierre Negrin. Bookmark the permalink. A wonderful review; “throwing beauty and danger into the fire together” is a gorgeous line. I’m glad we both fell for this one. And thank you for the link! Reminds me that I need to include such links myself (much!) more often. Thank you Persolaise! I’m glad you enjoyed it and that we both appreciate just how wonderful Opus VII is. Like you I could definitely put more links in. It’s difficult when you don’t necessarily read reviews before writing your own. When I tried this perfume I was overwhelmed and as much as I understood its beauty a bit I am unable to wear this perfume. Its like it was wearing me not me wearing it. I can see what you mean about Opus VII wearing you. It’s definitely a bold statement of a perfume. I completely agree with your perception of this and I am glad I am not the only one who thinks the amber in the dry down has similarities to VI (but it is greener as you point out). I am in love with this one even though, as you say, it is not the easiest to wear. It is so “Amouage” – nothing you could ever expect and yet so perfectly constructed. I’m so glad we’re on the same page here. Like you I love it despite the fact that it isn’t easy to wear – that’s what makes it so wonderful. A new release from Amouage is always newsworthy. “Emerald green leather” makes it sound very striking. A blast of galbanum can be a wonderful thing. I can imagine that this could become addictive if you manage to get into it. Look forward to experiencing. it. Definitely! Nothing gets me running home from work more than the news of an Amouage package. Opus VII is definitely addictive. Disturbingly so. I will take daring over boring any day. Thanks for another great review, Thomas!